You’re making a responsible choice when you choose Mountain Glacier! The bottles used by Mountain Glacier are 100% recyclable. 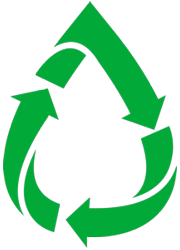 While this may seem minor, recycling is one of the most beneficial ways to help the environment and support the green movement! Our company supports the recycling movement, and proudly recycles all bottles returned to our facilities. Small things make a difference…and you can help! Our offices have committed to reducing paper use, and have saved thousands of pounds of paper by switching to e-statements! Our 5-gallon bottles make it easy to help support the green movement! These bottles support the concept of REDUCE, REUSE, RECYCLE! All of our 5-gallon bottles are reused and recycled to help reduce our carbon footprint. You can also help by switching to e-statements! Call a representative today and ask how you can help us in our green movement!